I’m a pretty quiet person, but I’ll speak my mind if you let me. I’m somewhat shy, but once you get to know me I won’t shut up. I’m an oddball, and most people don’t get me at all. But today, I’m opening up about something other than my quirkiness. To put it plainly, my life as a human being, and baker especially, has been ruined! Okay, I’m being a little dramatic, but that’s exactly what I thought when I received “the news.” I found out early 2012 that I have acquired some food intolerances. I never thought I would be opening up about this publicly on my blog, but I think explaining a few things (like the new ingredients I’m using, some ingredients I no longer use, etc.) would answer some of your questions. In September/October 2011, during the beginning of my sophomore year in university, I began to feel a little off. I was experiencing a wide range of symptoms from which I had no idea the causes — extreme fatigue, trembling, bloating, etc. I knew this was not normal, but I was in school with a heavy course load on my shoulders. I pushed my symptoms off to the side and pressed forward. After all, I was eating healthy, exercising regularly and feeling well most of the time. After a month or so, however, my symptoms progressively got worse — erratic heart rate, sudden sickness, rashes, etc. I started taking things more seriously and kept a food/symptom journal. I noticed a few patterns here and there, but the only thing conclusive was that I was sensitive to wheat. One morning I ate a whole wheat bagel with peanut butter and honey. I walked to chemistry class and all of a sudden I thought I was going to hurl on my friend in the middle of a 300-student lecture! For a couple of weeks I removed wheat and gluten from my diet (bye-bye bagels!) and I felt so much better, but only by 50%. My symptoms did not cease. Fall semester was a struggle, it was probably one of the biggest hurdles I have overcome in my entire life. I was stressed out with school, not feeling well during exams and frustrated that I couldn’t vent to my family who was across the country from me. I felt physically uncomfortable walking to, sitting in, and leaving class… the four-hour chem labs didn’t help either! It was even difficult to walk at times. I felt like I was using the last bit of energy my body had to simply raise my arms over my head or get out of bed. The results were in. News that relieved me, but also news that made my heart sink. To my doctors, I am in perfect health. I have gained more muscle and lost more fat, I have an “astounding cholesterol ratio” with low LDL (the bad cholesterol) and high HDL (the good cholesterol). My total cholesterol level today is lower than my LDL level alone in high school… something that surprised me since I’m a meat-eater and since high cholesterol runs in the family. So while I was happy to learn that I am not at risk for anything major, I was saddened to hear that I am sensitive to gluten and wheat. This was a pretty big shock to me. I mean, I guess I was more surprised because I was eating at least one gluten-filled food per day! As ridiculous as it may seem, I was angry. I felt like my body was betraying me, like I was being punished for eating healthy. I never experienced any sort of food allergies or sensitivities during my sugar-coma childhood! Thankfully though, I realized that the grass was still green. Food allergies and sensitivities don’t mean it’s the end of the world, I was just being a drama queen. I mean, I wasn’t allergic to chocolate, avocado, peanut butter, oats, and almonds, thank heavens. I was just close-minded to all the new foods that I could have. It took a lot of research to learn the ins and outs of my sensitivities, but to cure my symptoms, that time spent was worth it. I’m glad I learned that spelt was not gluten free and that buckwheat was, despite its name. I’ve come to the point where I can proudly say I have overcome this obstacle. Life can be a struggle at times, like going to restaurants and the fact that I have to plan my meals beforehand. Everyone has their problems, but we can always rise above. How did I rise above? After finding out what I was sensitive to, I thought I would never be able to enjoy an authentic baked good again. I would have to use unfamiliar flours and substitutes I have never heard of. But like a superhero, chocolate saved the day (and my sanity) when I made these brownies… the recipe quickly soared to being one of my blog’s most popular posts! But what tops those brownies? What beats that recipe by like, 250%? 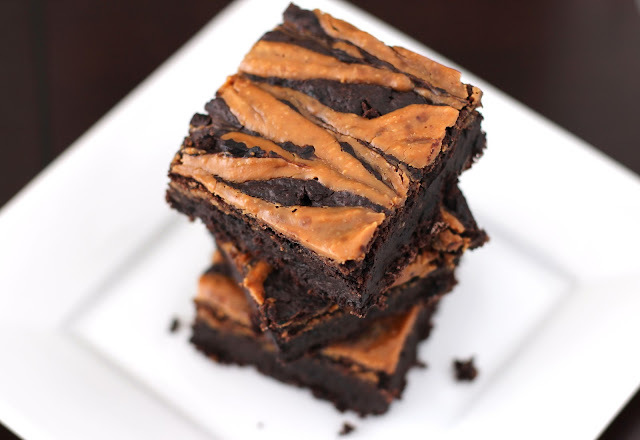 These sweet, incredibly fudgy (and secretly healthy) Peanut Butter Swirled Brownies that are packed with a peanut butter punch! 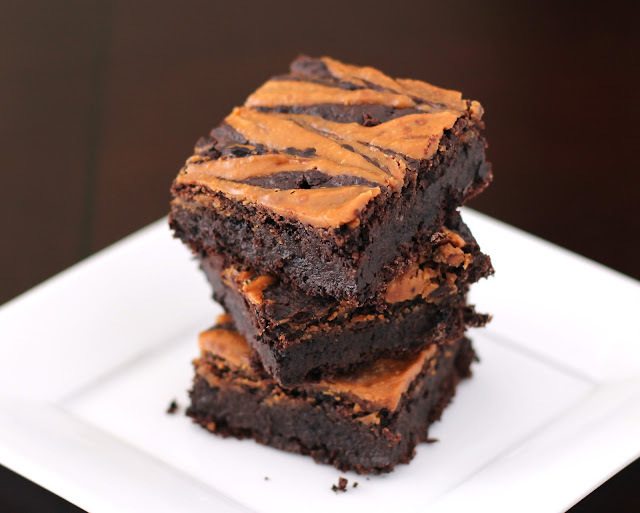 Super moist and secretly healthy, ULTRA FUDGY Peanut Butter Swirled Black Bean Brownies! Low fat, sugar free, high fiber, high protein, gluten free and vegan! Preheat your oven to 350 degrees Fahrenheit and spray an 8" brownie pan with cooking spray, set aside. In a small bowl, stir together the flax and almond milk, set aside to gel up. In a large mixing bowl, whisk together the erythritol, cocoa powder, quinoa flour, baking powder, baking soda, instant coffee and salt. In a blender, puree blueberries and measure 1/2 cup + 1 tbs. Remove any leftover puree from the blender and add the 1/2 cup + 1 tbs back in. Add the beans, oil, vanilla extract and flax gel and puree until smooth. In a small microwave-safe bowl, stir together the peanut butter and salt and microwave for 20 seconds, or until warm. Pour the dry over the wet and fold together (batter should be thick). Scoop into the prepared pan and drizzle the warmed PB mixture over the brownie batter in lines. Make swirls by dragging a knife the opposite way of the PB lines. Can you believe it?? 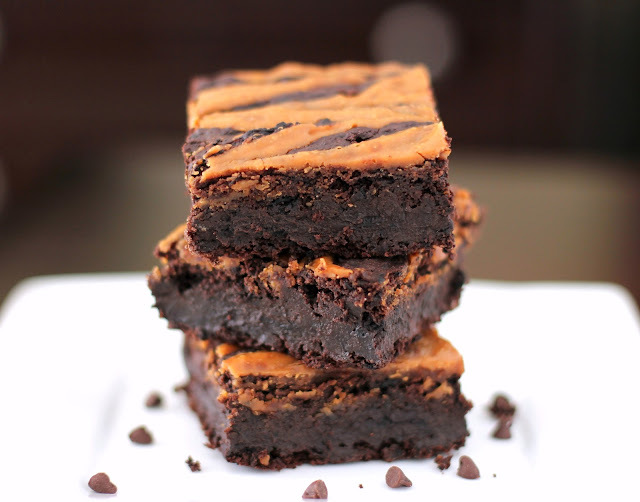 Super thick, fudgy and decadent Peanut Butter Swirl Brownies for only 150 calories a piece! They taste like giant fudgy calorie-bombs. They certainly don’t taste sugar free, high protein, vegan or gluten free in the slightest. So in case you were wondering… YES, you can have an extra brownie (or two) with no guilt involved. This recipe is a must make! 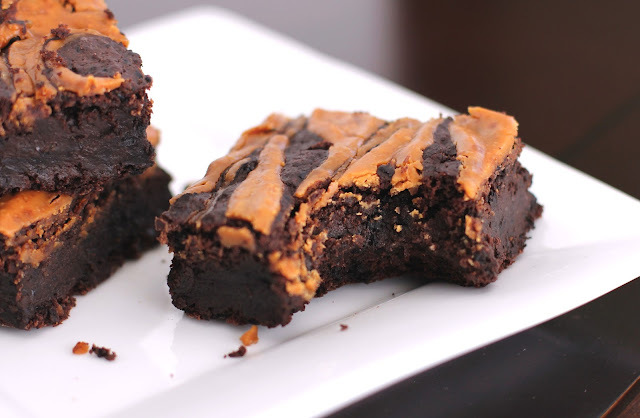 You really gotta make these Healthy Fudgy Peanut Butter Swirled Black Bean Brownies. Allergies or no allergies, they will rock your world! How long did it take eating GF for your sister to start feeling better? I have noticed that eating GF leaves me less weighted down, too. Now that I have found Mama’s gluten free flours, it is sooo easy and much less intimidating. Love those waffles and raspberry mocha brownies among a lot of other goodies! Thanks for sharing all you did about this! I’m so sorry you had to suffer so long before you found out what was bothering you! You have such a talent for making amazingly creative and delicious goodies, I have no doubt you’ll rise above any challenges this may create. 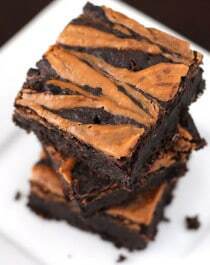 These brownies look insanely good! Love the dessert chart- I need to use one of those! I’m really glad you came forward to talk about this! Your allergy-friendly recipes are what brought me to your site. 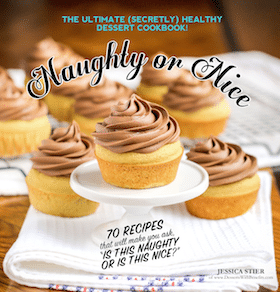 My oh my these look amazing I think it’s great that you dedicate your website to healthy desserts! It’s what I run to just to stare at when I have cravings because at least its healthy if I decide to make anything. Wish you well! And I am definitely going to make these soon after my training! You’re amazing! That must have been so hard to go through but it seems like you do a great job!!! 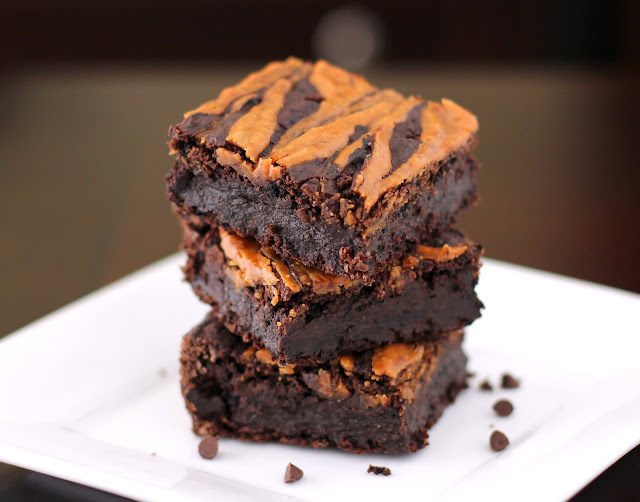 These brownies look so fudgy and dense and amazingly delicious!!!!!! I’m glad you can incorporate small amounts of flour now though! Thanks for finally sharing! I’m one who liked your blog before but it’s even easier for me to make your recipes now that they’re gluten and dairy free. I too developed allergies during college as a 20-something female, strange. It’s a long journey and don’t think it’s over yet, but good things can come from something as painful as food allergies. Hi Jessica! I just thought I’d mention that erythritol can be derived from a soy origin. I understand that it is a sugar alcohol, but I thought with your newfound allergies, you might like to know this. This recipe looks awesome, by the way! I’ve been really loving coconut sugar (do you ever use that?). The calorie content is higher, but some of these sweeteners that claim they are calorie free seem highly processed and scare me! These look amazing! I just have one question regarding your food intolerances, if you don’t mind?? How are you with oats? Do they make you sick? 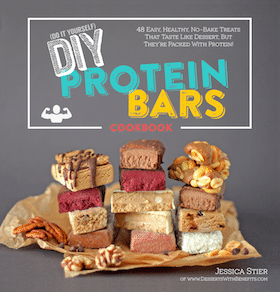 The protein in oats is remarkably similar to gluten and often causes problems. Bought to you by the gluten intolerant girl who can’t have oats either :(. Just wondering with your recipes with oat flour is I can substitute with rice flour? As for substituting the oat flour, I’m not sure… it really depends on the recipe. I find that oat flour provides a very soft texture and absorbs a little more liquid that rice flour, but that’s just in my personal experience. If you use rice flour, maybe try adding a tiny bit of xanthan gum (not too much or it will be gummy). Hope this helps! While I can definitely see as a food/baking…. scientist(?) hearing the news of having to eliminate so many easy and cheap ingredients would be upsetting, who more perfect than you to be given that challenge and help so many in similar situations! So far the only items that cause a reaction in me is artificial sweeteners. I am sensitive to side effects of many things such as medicine also so I always research when something “new and natural” comes out. Luckily with me I can avoid medicines since I rarely need any and only use them when absolutely necessary (like during my c-sections;) and only using true natural sweeteners is easy when you make your foods yourself. Its hard though when you see something in the store that sounds so good then you see its full of some sort of artificial sweetener. After researching agave and Stevia, I stay away from those also which means I rarely ever have store-bought treats. A small dose once doesn’t seem to have much affect but frankly even for health reasons I just don’t bother and try to come up with my own homemade versions. I developed my allergies when I was seventeen. At first I found that it was so weird to have just noticed these food allergies while most kids get them when they are a lot younger. My doctors now speculate that it was caused by my long use of antibiotics. I’m still in the healing process with regards to my stomach. I can’t eat anything high in fat or fiber along with my allergies… So that rules out nuts, coconut, beans, cauliflower, broccoli etc. Hopefully one day some of my allergies and sensitivities will go away, but for now I just have to deal. I’ve been reading your blog for a bit but have yet to bake anything yet because i’m kinda a wing-it type when it comes to cooking/baking and your recipes look so perfect! I’ve been allergic to raw bananas since I was little (it is more of an oral allergy(proteins are similar to pollens I am allergic to) since I can eat them raw)and I’ve been very sad I can’t eat all those banana “froyos” i’ve been seeing online. ps. these are great tests to get http://www.pirllab.com/lab/pirl_science.html as they are cutting edge but not covered by insurance yet 🙁 IgG testing means nothing most of the time (good allergists just use IgE testing) so if you never had a problem eating something, please don’t avoid it just because the test says you are sensitive! It is just so disheartening to hear that kind of news. I’ve had allergies all through my life, but some will appear out of the blue sometimes, and it’s very frustrating. 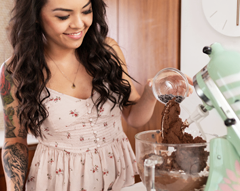 I’m so glad I found your blog – I love all of the recipes I’ve seen so far! Thanks for sharing, and good luck being allergy-free! I find you blog quiet interesting. I was wondering if I can substitute black beans with some other beans in case I don’t have access to it? Hi! You can most likely use another bean that is similar in texture (like cannellini beans, navy beans, etc). I wouldn’t recommend chickpeas because they tend to be a little on the dry side. Hope you like the recipe! Made these today and they were awesome! I subbed xylitol for the erythritol and it worked just fine. It was awesome being able to eat some brownies without having to feel totally guilty afterwards. Thanks! Hi, I recently found your blog. I must say, i really like it and even though I dont have any food allergies I’m very eager to try the recipes. The brownies look absolutely amazing! Just made these! They were delicious and not the typical recipe combining the same ingredients and manipulating them in different ways! Posting them on my blog, and promoting your page! Thank you! Wow these looks amazing! Good job! I’m on a strict candida diet so I’m dreaming about what I can eat when the diet is over (at least 2 months left). On the diet I can’t eat any kind of flour, cacao or peanut butter, no almond milk (or any milk), no baking powder (and of course no sugar but there aren’t sugar in the recipe). The body transforms food into glucose within the body, so avoiding excess carbs is a good idea. Good luck, you’ll do well! Made these tonight and they turned out pretty well! I think next time I make them I’ll need to add more sweetener, since they were not very sweet at all. It might have just been the brand of erythritol? I’m not sure I haven’t had much experience with it yet since I usually use stevia, although I know it doesn’t usually bake that well for me. I also think adding some powdered PB into the batter would be awesome! Or adding more coffee to make it darker/richer. Definitely going to be trying this again and experimenting! Might try using cherries or strawberries instead of blueberries! I love this brownie! I used vanilla stevia, but only used 1/3 cup because it’s so much sweeter & brown rice flour. I also put in carob and mini chocolate chips and topped with pecans! In an earlier comment you mentioned using xanthan gum with rice flour—how much should I use for 1/4 cup of rice flour? And what does it do to the texture? Thank you for helping me eat healthy, even the sweet things!!! I’ve actually tried these brownies with brown rice flour and they turned out just fine without the xanthan gum!